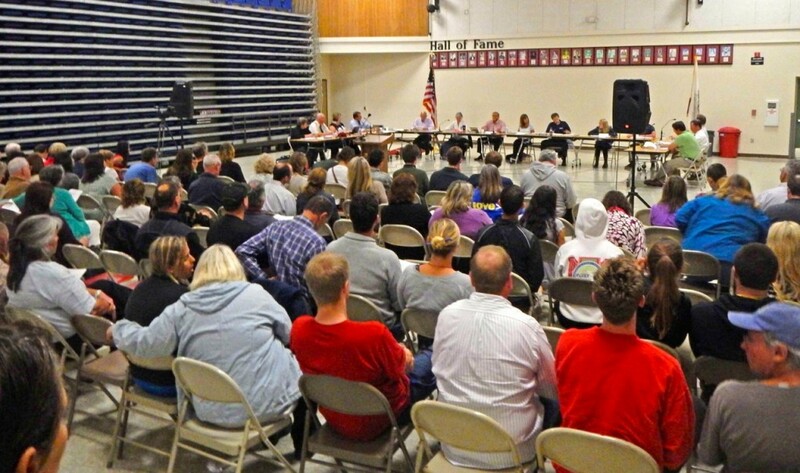 McKINLEYVILLE/ARCATA – With the festering scandal over a plagiarized speech crippling its ability to conduct business, and with the public demanding that action be taken, the local high school board voted tonight, Sept. 10, to ask Trustee Dan Johnson to resign. More than 140 people packed into the McKinleyville High School Multi-Purpose Room to hear the Northern Humboldt Union High School District Board of Trustees address the issue, which has plagued the district since Trustee Johnson gave a plagiarized speech at the Arcata High School graduation ceremony on June 13. The board listened to comments from the public, some of whom demanded that Johnson resign. There were also numerous Johnson supporters, including friends and family, who thanked the board member for his contributions to the community and said they accepted his apology. Johnson apologized for his speech, but said that it is time to move on. He said he wished that the passion people have invested in the controversy could be redirected to helping local children and students. He said he was disheartened by some of the mean and hurtful comments that have been made. He said the issue could have been handled better, not just by him but by staff. “It’s time to move on,” Johnson declared. His fellow trustees, clearly frustrated, questioned whether that was possible. “I do not want this to go on any longer,” said Trustee Dana Silvernale, who had requested that the item be placed on the agenda. “We need a resolution this evening of some kind,” Silvernale said. An emotional Pigg said he was at a crossroads. He went to high school with Johnson, who he considers a friend. Pigg said he didn’t think the damage from the controversy is repairable, and said he would support asking for Johnson’s resignation. “I don’t think we can heal from this,” Pigg said. After more discussion, Silvernale made a motion to ask for Johnson’s resignation. Trustee Colleen Toste seconded the motion, saying she was responding to the public’s desire. Trustee Dan Collen said he was a “process guy” and didn’t see the point of asking for Johnson’s resignation. The voters, he said, have the option of recalling Johnson. Voting in favor of asking for Johnson’s resignation were Pigg, Silvernale and Toste. Collen dissented and Johnson abstained without comment. More details, along with video, will be posted soon. Check back for updates. This entry was posted on Tuesday, September 10th, 2013 at 9:23 pm	and is filed under News. You can follow any responses to this entry through the RSS 2.0 feed.